Canon's latest compact system camera is perhaps the first time the company has launched a CSC for a "serious" audience. The Canon EOS has a sort of miniaturised DSLR look about it, with nicely curved lines which give it a stylish look. 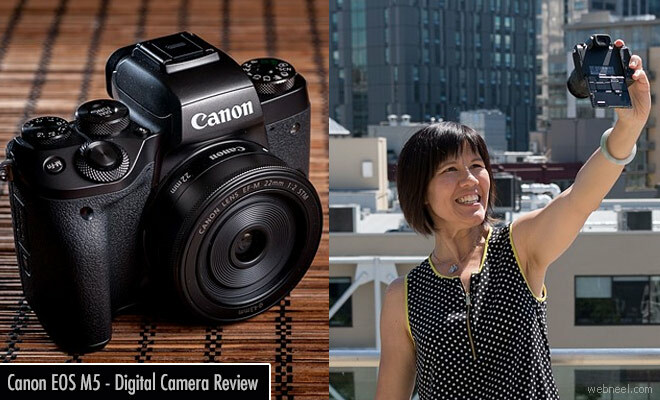 It’s not quite on par with some of the retro cameras on the market, but it has an attractive look none-the-less.Around the front part of the Canon EOS M5 is a rubberised coating which makes it feel high quality, and also helps the camera feel nice in your hand. There is a protruding grip which again helps you get good purchase on the camera - with your forefinger resting naturally on the shutter release button. The Canon EOS M5 uses the same Dual Pixel autofocus system as the company's EOS 80D, so it should offer broadly similar performance, although with the caveat that there will be some dependence on lenses (Canon's EF-M 22mm F2 pancake lens is particularly slow to focus). In any case, let's see how the EOS M5 fares in its own tests. White balance on the M5 is consistent and fairly neutral (with an option to preserve warmth in a scene, or be even more neutral), and overall color rendition is still a strong point. Video capture on the EOS M5 comes with an almost dual personality - it is an exceptionally easy camera to get smooth, accurately focused video with, but at the end of the day, you're left with footage that maxes out at 1080/60p and with a lack of detail that may result in some users left wanting more.